From 7am PT to 6pm PT (10am ET - 9pm ET), make sure to get ALL the Swag Codes with the Thanksgiving Swag Code ExtravaGOBBLE from Swagbucks! With 5 Swag Codes throughout the day, you can get up to 35 SB in codes alone! Not to mention that for every Swag Code you redeem via the app or Extension, you contribute 5 points to your team for the Feast On This Team Challenge. 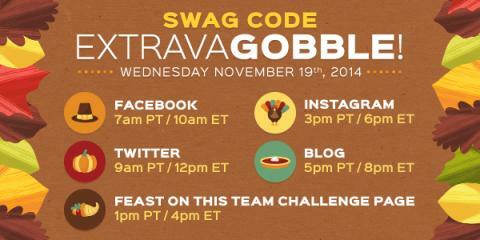 You can find Swag Codes on Facebook, Twitter, the Team Challenge page, Instagram & the SB blog, so keep an eye out! And stick around all day for more fun, games and other ways to get bonus SB. Not a member yet? Swagbucks is a simple way to turn your fun online (and even the not so fun like using a search engine!) into gift cards! 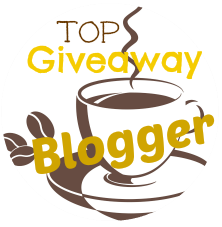 Sign up for free here, and start redeeming Swag Codes? Don't know how? When you find a code, click on the Swag Code vault icon at the top of Swagbucks.com & enter it exactly as shown (Swag Codes are case-sensitive). That's it! Join the fun & let me know how many Swag Codes you were able to get today!